Welcome to Middle Tennessee Fence! We are a family-owned fence company in Murfreesboro, TN that has been serving our local community for 15 years. We are serious about our commitment to professionalism and we are passionate about customer satisfaction. We know that customer service can make or break your experience with any company, regardless of how great the product or service is. We are dedicated to your satisfaction and do everything in our power to provide you with the utmost professionalism and the best fences in Middle Tennessee. We only utilize the best materials available, and our highly-trained team is experienced, professional, and attentive to even the tiniest details. Our crews are respectful of your property, and we always maintain a clean working environment. We are always up front and honest with you about our recommendations, our pricing, and our expected timeline. We stay focused on the job at hand, and we work hard until you are fully satisfied with your completed fencing project. We truly desire to teach you about your fencing options and help you make the best decision without the stress of sales pitches. Our fence company in Murfreesboro, TN can install wood fencing, aluminum fencing, vinyl fencing, privacy fencing, pool fencing, chain link fencing, fencing gates, railings for porches and decks, retaining walls, automatic gates, brick & stone columns, and more. We will help you look at all your options and the various pros and cons of each so that you can make an informed decision about what type of fencing will work best for you. 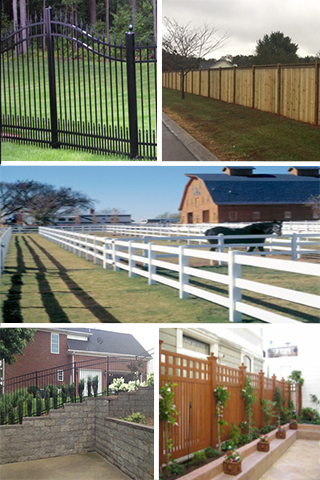 Here at Middle Tennessee Fence, we are a fence company in Murfressboro, TN, but we serve the entire Middle Tennessee area. Our service areas include Franklin, Nashville, Brentwood, Mt. Juliet, and of course Murfreesboro. Here at Middle Tennessee Fence, we look forward to working with you and meeting your fencing needs!